Valorisation is one of the three pillars of TU Delft Robotics Institute, next to education and research. To connect robotics to business and society, the institute has initiated RoboValley. Because of the scope of activities this robotics valorisation programme encompasses, and the vision we have for the development of the larger Delft area as a worldwide innovation hub for robotics, RoboValley is a separate institute. 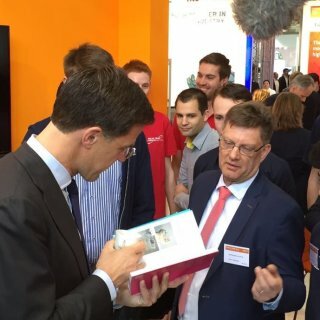 It has close ties to both TU Delft Robotics Institute and the TU Delft Valorisation Centre. "RoboValley connects all the key players in robotics"
RoboValley connects all the key players in robotics: researchers, entrepreneurs and decision-makers in both public and private sectors. Thus, a unique network is thriving, with TU Delft Robotics Institute at its heart. Therefore, RoboValley takes a leading role in the development of the next generation robotics. The RoboValley programme team makes sure companies can find and make use of the available knowledge. They also have experts that help companies or start-ups that want to settle in Delft. RoboValley also attracts investors: via the RoboValley Investment Fund venture capital and accelerated paths to the market is offered for the most promising robotics technologies. More than 30 start-ups have already settled in RoboValley, next to existing robotics companies. It is expected that between 15,000 and 25,000 jobs will be created in RoboValley in the next 10 years. These robotics companies will need between 250,000 and 360,000 square metres of lab and office space. TU Delft Valorisation Centre plays a similar role for Delft University of Technology. To transform technological innovation into practical added-value applications for society, assistance from external partners is needed. TU Delft Valorisation Centre collaborates with businesses, governments and civil society organisations to make sure the knowledge of Delft University of Technology benefits society as a whole.